It's been a rather unusual week for us here in the forest as our Big Forest Folk have been out on some in-house training. It's great for us to get together with the Chiswick team and share practice and ideas. We have all been very inspired by what we've learnt and certainly feel that all of your children will benefit from this! 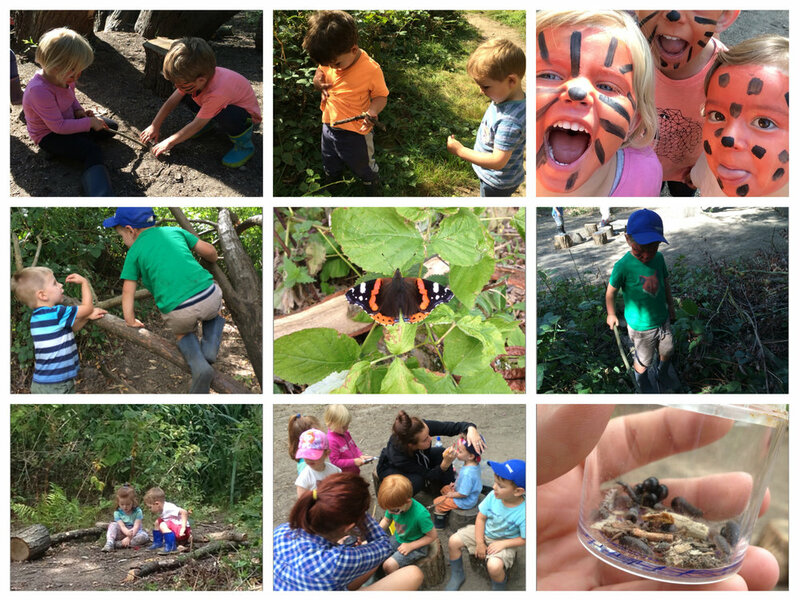 Meanwhile, in the forest we have continued to have lovely experiences! We have had fewer children to allow for the training to take place, but we have kept just as busy with our usual favourites- building fires, climbing, running, jumping and lots and lots of laughing! We've been on lots of adventure walks, which the children have adored. They had a particularly good time at "the beach" where we spotted some rather large fish swimming! This prompted great discussions about where the fish had come from, and where they might be headed next. We also used the opportunity to discuss quantity as we counted them and estimated how many fish there were in total. We have been enjoying some creative activities in base camp using paints and engaging in role play games. Some children have been very interested in refuse collection role play! They have 'tidied' the floor of bark, leaves and twigs and loaded these into wheelbarrows before transporting it all to the "rubbish dump". One group of children were engaged in this game for ages, instructing each other and working collaboratively to move larger items. "There, you missed a bit!" "what about this one, is it also rubbish?" We have also loved using our new collection pots and immediately began filling them with all sorts of forest treasures! When one child found a wealth of woodlice she grabbed her pot and exclaimed "this is a great opportunity!" as she carefully placed the tiny creatures into the pot for closer inspection. Our new website is now up and running. It includes the videos we filmed in the forest a few weeks ago, which are so beautiful they make us wish we were Little Forest Folk children! These are really worth taking a quick look at, you might even spot your little one in them! We are back to term on Monday and can't wait to see all of our sessional children again! Please remember that we are closed to families on Tuesday 6th September for a staff inset day. Over the next couple of weeks we will be welcoming some new children into the forest. We are certain our Little Forest Folk regulars will all be keen to show them around and make them feel welcome. You may begin to hear some new names at home too! According to the forecast next week is due to be another hot one! Please remember to apply your child's first layer of sunscreen before they arrive and pack a named sunhat into their bag. Thank you!